Salivary gland tumors are the result of abnormal cells that develop in the salivary gland or ducts. These tumors typically cause a firm, painless growth in the salivary gland. The growth may eventually get so large or invade nerves that it causes facial palsy and paralysis. The most common types of salivary gland tumors are non-cancerous; however, certain salivary gland tumors can be malignant. Pleomorphic adenomas account for approximately 70-80 percent of all salivary gland tumors. 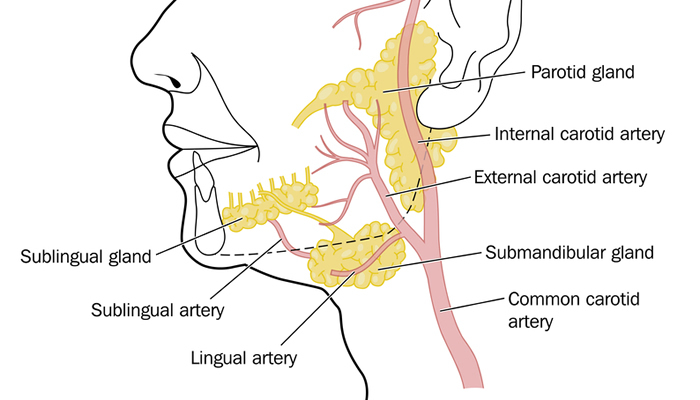 They are most likely to occur in the parotid gland but can also occur in the lingual, submandibular, and minor glands. Pleomorphic adenomas are non-cancerous. Warthin’s tumors are the second most common form of benign salivary gland tumor. These tumors tend to be painless, slow growing, and are most common in older adults. Warthin’s tumors typically affect the parotid glands bilaterally. They are more common in smokers. Mucoepidermoid carcinomas are the most common form of malignant salivary gland tumor. The tumor is the result of uncontrolled cell growth and multiplication. Mucoepidermoid tumors typically present as a hard, firm, fixed mass that is normally painless. Acinic cell carcinomas commonly affect the parotid gland and may cause pain and tenderness. The tumors are typically slow growing and can be locally aggressive. Most patients are first diagnosed with acinic cell carcinomas in their early 50s, which is slightly younger than with most other forms of salivary gland tumors. Adenoid cystic carcinomas are a relatively rare form of salivary gland cancer. These tumors account for approximately 28 percent of submandibular salivary gland cancers. Adenoid cystic carcinomas may be painless in the early stages but can cause pain and facial paralysis as they advance. These tumors tend to spread through nerves and can sometimes spread to the lungs. Squamous cell carcinomas represent approximately 90 percent of head and neck cancers. If caught early, many squamous cell carcinomas can be safely removed through an in-office surgical procedure. Advanced cancers may require aggressive surgery and radiation therapy. Carcinoma ex-pleomorphic is a type of salivary gland cancer that originated as a benign pleomorphic adenoma but transformed into a malignant tumor. This is more likely to occur the longer the tumor remains untreated. Signs that a tumor has turned cancerous include pain, rapid growth, and facial numbness or weakness. If the presence of a tumor is confirmed, the doctor will likely order a biopsy. This involves taking a small sample of cells from the tumor to determine if the growth is cancerous. Approximately 65 percent of sublingual and minor salivary gland tumors are malignant. Fifty percent of submandibular and 20 percent of parotid tumors are malignant. The first line treatment for salivary gland tumors is surgical removal of the affected salivary gland. If the tumor is malignant, the patient will undergo further treatment that may include radiation therapy, chemotherapy, or both. The long-term prognosis for malignant salivary gland tumors varies based on the stage, location, and type of cancer cells as well as the patient’s age and overall health.